Faribault’s new promotional billboard, visible while traveling southbound along Interstate 35 near the city. Faribault is about a half hour south of the Twin Cities metro and about an hour from the Iowa border. Perfect for a day trip. MY COMMUNITY OF FARIBAULT could easily fall into that grey space of endless towns perched along Interstate 35 from the Texas-Mexico border to Duluth in northeastern Minnesota. But Faribault, pronounced fair-uh-boh, because it’s a French name, isn’t just any other community. This is a city of some 23,000 with a strong sense of history. Drive a few miles off I-35 to see the aged buildings along and branching off Central Avenue and scattered throughout town. We have historic churches (like the Cathedral of Our Merciful Saviour) and the historic Shattuck-St. Mary’s School and wonderful old houses. A new billboard along I-35 hints at what you’ll discover in this southeastern Minnesota community named after founder and fur trader Alexander Faribault. This remains one of my all-time favorite shots of Faribault’s Central Avenue, our Main Street. It showcases the aged buildings and beauty of our historic downtown. Minnesota Prairie Roots file photo, December 2011. HISTORIC DOWNTOWN: Aged buildings, most beautifully restored, border Central Avenue for several blocks. If you appreciate old architecture, history and home-grown businesses, then you’ll enjoy our downtown. Award-winning Amablu Gorgonzola from Caves of Faribault. Minnesota Prairie Roots file photo. BLUE CHEESE: Award-winning blue and Gorgonzola cheeses are produced and aged in Faribault, in sandstone caves along the Straight River. I’m crazy about AmaBlu, St. Pete’s Select and AmaGorg cheeses. All are sold at The Cheese Cave, a Central Avenue retail shop that also serves up a limited menu of soup (seasonal), sandwiches, salads, pizza and more. The fresh cheese curds, flavored and plain, are a must-try. Iowa-based Swiss Valley Farms now owns the once locally-owned retail shop and cheese company. Samples from a flight of F-Town beer. Minnesota Prairie Roots file photo. BEER: F-Town Brewing Company opened in the downtown historic district, just a half-block off Central Avenue, last summer. It’s a great addition to our community, continuing a tradition of early beer brewing in Faribault by the Fleckenstein brothers. Perusing merchandise at the Faribault Woolen Mill retail store. Minnesota Prairie Roots file photo. BLANKETS: The historic Faribault Woolen Mill has been weaving blankets for some 150 years. Visit The Mill Store (open daily except Sunday) and/or tour the mill (every Friday or the second Saturday of the month) along the banks of the Cannon River. This business produces quality made blankets, throws, scarves, etc., in the time-honored tradition of hands-on looming by employees who’ve been around for a long time. This restored 1915 clock was installed in 2015 on the Security State Bank Building, 302 Central Avenue. Minnesota Prairie Roots file photo. ART: Stop at the Paradise Center for the Arts, a restored theater, to peruse the galleries and gift shops or to take in a show. Admire the recently-restored Security Bank Building clock at 302 Central Avenue. At the south end of Central Avenue, at its intersection with Division Street, admire the art throughout Buckham Memorial Library. Don’t miss the Charles Connick stained glass window, the Greek murals or the exterior clock tower. Throughout the downtown area are numerous murals depicting scenes from Faribault history. I love this concept of combining art and history in such a highly-visible public way. While I’ve never toured Whillock Studio, home to woodcarver Ivan Whillock, I’d suggest a visit. Locally, his work can be seen in churches, at the library and more. 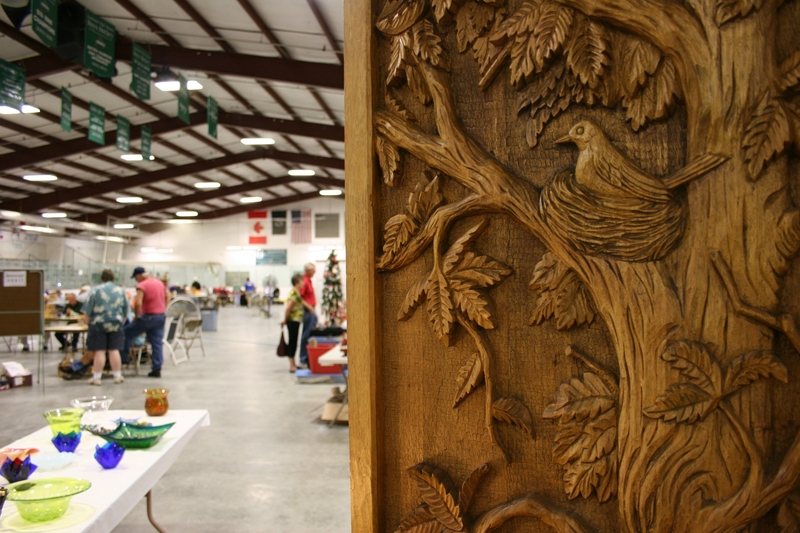 Noted woodcarver Marv Kaisersatt also calls Faribault home. Kaisersatt keeps a low profile. But I was lucky enough to visit his second floor downtown studio (not open to the public) several years ago when penning a magazine article. Folks waited in line at last summer’s Faribault Farmers Market for these cupcakes from Bluebird Cakery. The business now has a storefront location at 318 Central Avenue, Suite 101. Minnesota Prairie Roots file photo. FOOD: Hands-down, The Signature Bar & Grill serves the best thin crust (or any) pizza in town. I always order the Italian sausage. The old-fashioned bar area is reminiscent of Cheers. The Depot Bar & Grill, housed in an old train depot, is always a good dining choice. Warm weather outdoor dining is available on a patio next to the railroad tracks. It’s a thrill to feel the power of a train roar past only feet away. Faribault offers many ethnic dining choices ranging from Mexican to Somali to Chinese, Thai, etc. Gran Plaza Mexican Grill downtown is a local favorite. Fairly new to downtown Faribault is Bluebird Cakery, specializing in cupcakes (plus other sweet treats) and assorted coffees, etc. I’ve been there several times and each time it’s been super busy. Choosing cupcakes proves difficult given all of the enticing flavors. I’m not a fan of fast food or fast food chains. But for an authentic American fast food dining experience, Faribault’s A & W still offers car hop service during the warm months. And I do love a frosty mug of A & W root beer. New to Faribault, and hidden away in the Faribo West Mall, is Smoqehouse Restaurant. I’ve been there once and will definitely be back as I love pulled pork and other savory smoked meats. The smokey smell alone is enough to draw me in. Take note that if you want to eat here after the mall closes on say a Saturday evening, you need to use the back entrance across from the Walmart Auto Center. Burkhartzmeyer Shoes, a family-owned shoe store along Central Avenue in Faribault. Minnesota Prairie Roots file photo. SHOPPING: I’m not much of a shopper. But I do like thrift stores–you’ll find Good Will, the Salvation Army, All Seasons Community Services Thrift and Jan’s Thrift Shop in Faribault along with some used clothing shops. Third-generation family-owned Burkhartzmeyer Shoes is a Faribault staple offering full shoe-fitting services (yes, they measure your feet and put the shoe on your foot) and shoe repair. This place is reminiscent of a bygone era when outstanding personal customer service mattered. I know nearly everyone who works here and these are salt-of-the-earth wonderful people. Shoe boxes are tied with a cotton string and you’ll even get a sucker if you want one. We also have gift shops, antique stores, an architectural salvage business and more in our historic downtown. Tables packed with colorful flowers fill the Faribault Garden Center. Minnesota Prairie Roots file photo. Farmer Seed and Nursery, in an aged building along Minnesota State Highway 60/Fourth Street, is a fun place to poke around for anything plant and garden related. This business has provided American gardeners with plants, bulbs, seeds, etc. for more than 120 years through its mail order catalog (also now online) business. It’s especially fun to tour during the holidays when themed Christmas trees pack the store. Donahue’s Greenhouse is open for the season, drawing gardeners from all over to this massive family-owned greenhouse/retail shop at 420 SW Tenth Street. After a long winter, this feels like walking into summer. I get a bit overwhelmed with all of the choices at Donahue’s, thus I often shop at the smaller Faribault Garden Center or Northstar Seed & Nursery. Twiehoff Garden & Nursery on the east side is another great choice for plants and then fresh produce throughout the growing season. Housed in a no-frills pole shed style building which lends an earthy authenticity, this 52-year-old business is operated by the friendly Twiehoff family. It’s one of my main sources for local fresh seasonal produce along with the Faribault Farmers Market. Biking through River Bend Nature Center. Minnesota Prairie Roots file photo. NATURE: One of my favorite places for an in-town get-away is River Bend Nature Center. Faribault also has an extensive trail system for biking and walking. City View Park, on the east side by the water tower, offers a beautiful overlook of Faribault. The restored Tilt-A-Whirl sits in downtown Faribault next to Burkhartzmeyer Shoes, just two blocks from Buckham Memorial Library. Minnesota Prairie Roots file photo. HISTORY: It’s everywhere in Faribault. In the architecture of old buildings. On murals. In the Rice County Historical Society Museum. In our churches, especially The Cathedral of Our Merciful Saviour. In the historic Hutchinson House Bed & Breakfast. Even in a restored Tilt-A-Whirl car located on the corner by Burkhartzmeyer Shoes. Yes, the Tilt-A-Whirl originated in Faribault and, up until a few years ago, was still made here. I love Faribault. I’ve lived here more than half my life now. I don’t have the connection of family roots. But I do have the connection to place. Faribault is home. DO YOU HAVE ANY QUESTIONS about Faribault? If so, ask away and I’ll try to answer. FYI: Chambers of Commerce and tourism centers in Faribault, Owatonna and Northfield have joined in promoting visits to their communities through a Minne-Roadtrip venture. All three cities lie along the I-35 corridor, with Faribault in the middle. Click here to learn more about this promotion. I’ve explored all three communities; they are definitely worth your visit. Kim, come visit us any time. I’d be happy to show you around Faribault. I’ve been pronouncing Faribault incorrectly the whole time I’ve been reading your blog. It is a silly thing to have to notate, but it really is important to know how to pronounce a name and know a little history about how the name was acquired. At least to me it does! 🙂 I can see us visiting someday and we’ll be sure to stop at the Cheese Cave (for me) and FD will want to stop by the F-town Brewing Company. I hope there are some antique stores as well? Not that I need anything… I’m already up to my eyeballs in decor but it sure is fun looking! Don’t feel bad about mispronouncing Faribault. It happens all the time. Before I moved here in 1982, I made the same error. And I grew up in Minnesota. Yes, there is a lot to do in Faribault and sometimes it’s good for me to stop and assess that. Often we take for granted the places in which we live. Where is the architectural salvage building? Great article…. New business in town…fresh baked bread, local produce open Friday and Saturday – Crack of Dawn on Central. Welcome to Faribault, Crack of Dawn! I had no idea you were in town. So thank you for commenting. Tell us more about Crack of Dawn, including your exact location, hours, etc. and what you offer. The architectural salvage place is located in the Peterson Art Furniture building next to F-Town Brewing. However, I see that the business is closing to make way for the Frogtown Event Center. I just learned that after checking the Facebook page. I was a customer at Crack of Dawn. They are in the space where Ginger Spice was. Crack of Dawn has delicious artisanal breads, baguettes, sweet rolls and a savoryroll too good to describe…Check them out! After I replied to your comment, I realized you likely were not the owner. Now you’ve confirmed that. I appreciate the tip. I recently noticed that Gingerspice was no longer open and am happy to hear about Crack of Dawn. It definitely sounds like a place worth checking out. I love the name. Oops you’ve done it again Audrey. Thank you for the wonderful photo’s and story about our great community. As a local and the Director of the Faribault Foundation we appreciate what an asset you are to our fair city!!! Thank you, Dee. I feel the same about you. Great pictures, looks like my kind of town ( stoplights and all, which I imagine there are)! Question, my wife want’s to do a road trip this fall to see fall colors, does Faribault have many hardwood trees that would make the town, country and hills colorful? She particularly likes the reds. What month would be optimum for this activity? Thanks! The Tilt-A-Whirl Oh My growing up that was my favorite ride at Mt. Lake’s Pow Wow celebration. Don, Faribault is beautiful in the fall, especially around the end of September into early October, depending on the year. Nerstrand Big Woods State Park (part of the original Big Woods–think Laura Ingalls Wilder) is a short drive away and is a popular place for visitors in the fall. Google it. Also, anywhere in southeastern Minnesota, especially along the Mississippi River (think Wabasha, Winona, Red Wing, etc. ), is stunningly beautiful in the autumn. I think Faribault could do a lot better in promoting its fall colors. If you decide to come and visit, please let me know. Randy and I would love to have you and your wife to our house. Do you still have family in Minnesota? My wife and I love road tripping in the autumn to view the colors and will certainly put Faribault and surrounding area on the list! We would fly into MSP, rent a care for 2 weeks and hit the road. Southern Minnesota, Wisconsin, the Upper Peninsula of Michigan and back down through northern Minnesota is the current plan. I have a sister living in Minneapolis and my wife has family in Wisconsin and Michigan so it would involve being a tourist and family visiting trip. I will certainly give you a heads up when we get to “Faribault country”! Excellent. It sounds like a great plan. Keep in mind that trees in northern Minnesota (ie. Duluth/North Shore) turn color earlier than here in southern Minnesota. And if you’re going to stay anywhere along the North Shore, book a hotel room well in advance. Otherwise you won’t find a place to sleep. BTW, Faribault has a lot of stoplights. Ten that I can think of. I do have a nice blanket made there I purchased at an auction here in TN ! Sweet. Faribault Woolen Mill blankets are quality blankets, as I expect you know. As you know I come to Faribault to watch our guys play in a softball tournament every fall. Alexander park is about all I know of Faribault. I REALLY need to do some more exploring of your beautiful city. I did drive around one day between game and explore some lovely neighborhoods with some magnificent homes. Maybe someday we will make it our road trip! OH… I almost forgot, Donohue’s is one of mom and my favorite places to flower shop 🙂 Thanks for sharing about your wonderful city Audrey, I can tell you are proud to belong to this diverse community. Likewise, I need to explore Rochester sometime. I’d welcome you to Faribault any time. Great job showcasing all your town has to offer. This summer I think I should head you way and try one of the eateries mentioned in this posting. You should. Bring your husband and Randy and I can enjoy a meal out with you. Do you or Charley drink craft beer? You’ve given me some ideas for places I can bike with my family! My husband and I recently bought touring bikes, so maybe we’ll bike around Faribault this summer! We would love to have you and your family visit Faribault this summer. There’s a bike trail that runs between Faribault and Mankato also. Oh cool, I’ll look into that. I like hearing about places that we can visit and bike around without having to drive too far.